MJD Interactive Agency specializes in web development, online marketing, and technology solutions. Areas of expertise include design, user experience, user interface, PHP/MySQL, Drupal and Ruby on Rails. Online Marketing strengths include Search Engine Optimization, Pay-Per-Click advertising and Social Marketing. MJD's other offerings include online sweepstakes software and reservation software. MJD's clients have included NBC Universal, Absolut Vodka, Beckman Coulter, Marzetti, Pfizer, San Diego State University, Neurocrine Biosciences, Cabot Cheese, Quantimetrix, Cor-o-Van, Jazzercise, Olympus, Medicinova, and many local Southern California based businesses. 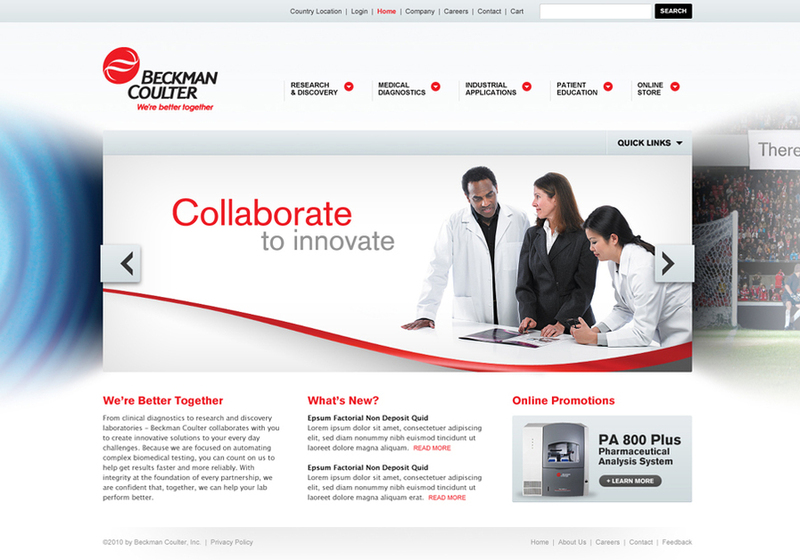 This is a concept design for Beckman Coulter.